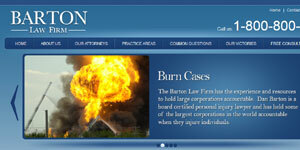 The Barton Law Firm has been serving the citizens of Houston, Texas for over 17 years. Mr. Barton and his team of attorneys have experience in a variety of practice areas including: personal injury, truck accidents, burn injuries, insurance claims, and more. The understanding of these fields of law allows us to represent all of our clients against some of largest companies in the country.